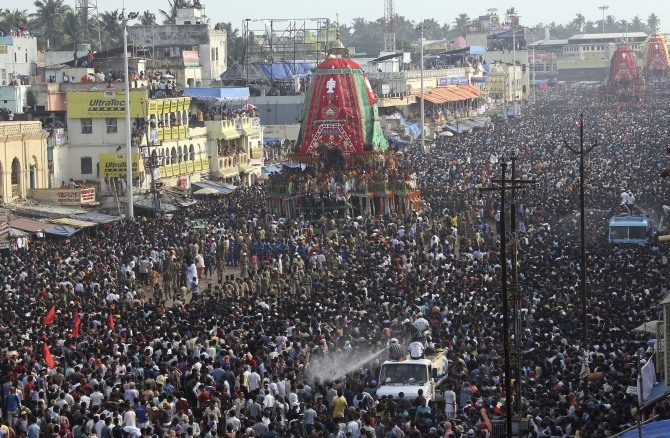 Over ten lakh devotees witnessed the world famous annual Rath Yatra of Lord Jagannath held in Puri on Sunday with fanfare, religious fervour and enthusiasm amid tight security as the practice of people climbing the chariots was stopped in a major reform initiative. However, Puri Shankaracharya Swami Nischalananda Saraswati did not visit the chariots before they were pulled accusing the Odisha government of interfering in religious matters by asking him to ascend the raths (chariots) alone without his disciples. "The state government has dared to dictate terms to the Shankaracharya of Puri. I will not visit the chariots before they are pulled for Rath Yatra," Saraswati had told reporters at the Govardhan Peeth in Puri on Saturday. Devotees from across the country and abroad descended on the pilgrim town of Puri in Odisha for a glimpse of the presiding deities of the 12th century shrine of Sri Jagannath and mingled with the sea of humanity during the annual festival of chariots. "The festival was held peacefully in a smooth manner. There was no untoward incident as elaborate security measures were taken," a senior police officer said. A tight security net comprising around 7,000 police personnel was in place as a precautionary measure, he said adding apart from force deployment, CCTV and spy cameras had been installed. Personnel of Anti Terrorist Squad (ATS), Rapid Action Force (RAF) and sharp shooters were deployed at vital points while the Coast Guard kept a vigil on the sea. The annual event was marked by a major reform -- the practice of devotees climbing the chariots and touching the deities was put to an end. Devotees poured in to the seaside town since early morning to watch the ceremony and pull the three majestic and colourful chariots on the 'bada danda', the grand avenue. A host of VIPs including Odisha Governor S C Jamir and Chief Minister Naveen Patnaik witnessed the proceedings. As the presiding deities, Lord Jagannath, Lord Balabhadra and Devi Subhadra set out from the sanctum sanctorum of the temple, a number of special rituals like 'Mangla Arati' and 'Mailam' were performed. Descending from the Ratna Sinhasana, the bejewelled throne, the three deities were taken out of the temple down the 22 steps known as 'Baisi Pahacha' through the Lion's gate in an elaborate royal ritual called 'Pahandi' as devotees and sevayats jostled to have a glimpse and touch them. The temple was thrown open to public only yesterday for 'Naba Jaubana Darshan' of the deities as they remained confined in 'Anasara Pindi' (recovery chamber) after the grand bath on 'Snana Purnima' held on June 13. The trinity proceeded majestically in their journey to the world outside during Pahandi. At first Sudarshana, the celestial wheel of Krishna-Vishnu, was taken out and placed in the chariot of Subhadra followed by Balabhadra, and Jagannath. Ready to carry the deities for their annual nine-day sojourn to the Gundicha temple, about two kilometres away, the three majestic wooden chariots waited outside draped in layers of red, black, green and yellow cloth. The 45-feet high 'Nandighosh', the chariot of Lord Jagannath, stood with 16 huge wooden wheels, while Balabhadra's was the 44-feet high 'Taladhawaja' with 14 and Subhadra's 'Darpadalan' was 43-feet high with 12 wheels. Braving the scorching heat, devotees thronged the grand avenue to watch the proceedings as the police had a trying time controlling the surging crowd. While the proceedings remained a smooth and peaceful affair, the Shankaracharya stuck to his Saturday’s decision. His reaction had come immediately after his office received a letter from the Sri Jagannath Temple Administration. The letter said the Shankaracharya should pay "darshan" to the trinity Lord Balabhadra, Devi Subhadra and Lord Jagannath alone on the chariots and must not be accompanied by his disciples. SJTA's letter to Govardhan Peeth, the seat of the Shankaracharya, came after some priests alleged that Saraswati paid darshan along with his disciples every year. "We respect the seer and will allow him on to the chariots. But he should not take his disciples along with him as he had been doing," Ramakrushna Dasmohapatra, president of Daitapati Nijog had said. "We are self-disciplined. I know how many disciples will accompany me onto the chariots. The administration should not try to teach Shankaracharya," the Shankaracharya replied. Stating that he was aware of the inconvenience being created for people due to rush on the chariots, the seer said, "We were the first to advocate lessening of the crowd on the chariots." BJP leaders and Union Ministers Dharmendra Pradhan and Jual Oram also met the seer on Sunday and held discussions with him. "It is a matter of concern that the Shankaracharya has been deeply hurt by the act of Odisha government and SJTA," Pradhan told reporters after the meeting, urging the chief minister to intervene and put an end to the row.